Judging Hearts and the Kitchen Pantry go hand in hand. The kitchen pantry can get messy fast! Tidy and organize it for the holidays and meet our crazy character Penelope Perfect! She is the inner-mom in all of us that pokes her perfectly pink manicured nail into our brain and tells us we are not doing it right. We are not baking the perfect bread; we are not dusting the most difficult to reach chandelier, or we are not sending the handmade Christmas dinner invitations that Suzy Sassy Homemaker from the PTA meeting suggested. She brings us down when we all know we should be up, up, up. Why: Because times have changed. The rules in parenting have changed. And, we are all swimming up-stream in this crazy busy world of technology, economic hardships and just plain old busy. Don’t judge the inside of your home and heart by glossy magazines or Perky Perfect People. You have no idea what is going on inside their hearts or homes, and they have no idea what is going inside your heart or home. Just take care of your family and do your very best for your home and your heart and to heck with the rest of the world. Don’t let your inner Penelope Perfect rule your days. She has no business in your business. I am going to stop preaching now, it is not my calling, but every once in a while I feel the urge to jump on the podium and let ‘her’ rip. 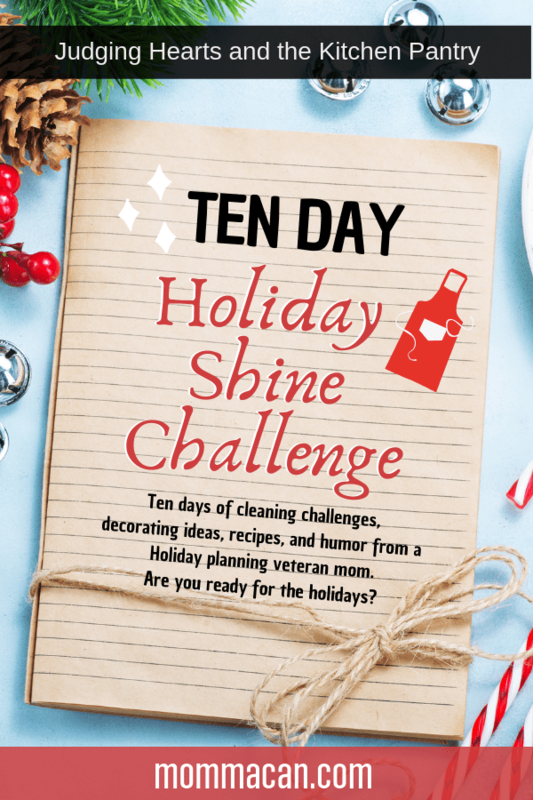 Holiday Shine Challenge: We are cleaning the kitchen pantry today. If we do not, then, things could get pretty crazy during a big cooking day. So let’s get to it. Clear out the entire pantry. Wipe down shelving with an all-purpose cleaner. Please do not over think the pantry. My only tip keeps the healthier stuff easy to reach and either ditch the unhealthy stuff or put it up high enough that the family will not go on a junk food binge. If you have a surplus of a certain canned item, consider creating a meal or two around those items in the next couple of days or donate a few to the local food pantry. There are several locations during the holidays collecting canned goods and other non-perishables to make baskets for Thanksgiving and Christmas. PSST! I am so happy to have you here! Don’t miss our free amazing resources in the library! Good tip on the pantry! Keeping healthy foods within easy reach is an awesome tip! Great tips on the pantry organization – thanks! I agree. We shouldn’t compare our homes and families to other people because they as perfect as they may seem, there are chances that they have underlying issues too. I know a couple of friends who’s families aren’t as perfect as they seem to be in public so I totally understand this. My husband and I never compare our marriage and family to others because we’ve grown to be contented with what we have and we love what we have. And with regards to the pantry cleaning, I always go and clean out our kitchen whenever I can because my Mom is so messy and things aren’t in place! These are some awesome tips, cleaning the pantry I do that all the time! Keep all the healthy food in arms reach, great point I started putting a box on the counter with healthy treats for all of us! We recently implemented leftover week — where we clean out the fridge and the pantry and skip grocery shopping for anything but milk and bread. It helps keep the freezer from hiding old food, gets us to gobble up the leftovers and keeps the pantry from getting too stuffed. Overall, it helps keep everything cleaner — AND helps the budget, too! 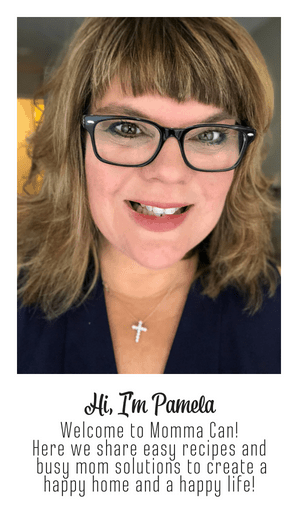 This is great post, Pamela. I am working on Christmas for our upcoming Home Tour, and am caught in an emotional tug-of-war. My inner Penelope wants a ‘magazine-spread-worthy’ living room. My heart says just dress it in way that make the room feel cozy and festive for my family. I am going to try shut down Penelope and run with my heart! Thank you for the encouragement. I need to find the time no make the time, to clean out the pantry, most definitely. Great tips.